These charming flowers are rather versatile, as they can be used to make flower garlands, table confetti, a brooch, a headband, pins—you name it! Try the different techniques detailed below to create different types of flowers. 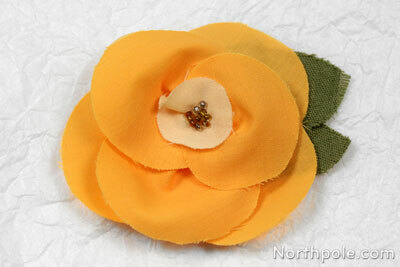 Make these flowers for any season and use as interchangeable appliqués. 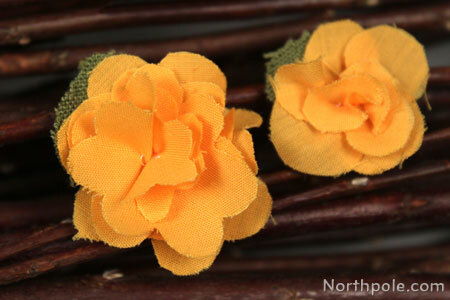 (Quick tip: Use hot glue to attach a safety pin on the back of each flower for easy attachment and removal.) 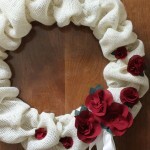 Attach yellow flowers to a wreath for spring and summer, then simply remove and replace with red and white flowers for Christmas. Cut out circles from desired fabric. You can cut the circles freehand; they do not need to be perfect circles. Fold a circle in half. 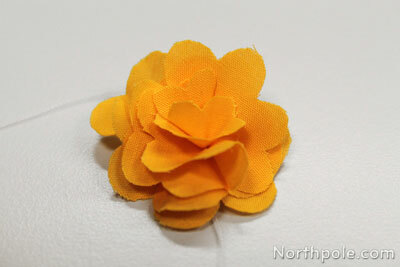 Hold the flower in one hand and sew a couple stitches near the corner of the fold. Tie thread in a knot. Poke the needle through the flower, bringing the needle/thread to the top of the petal. 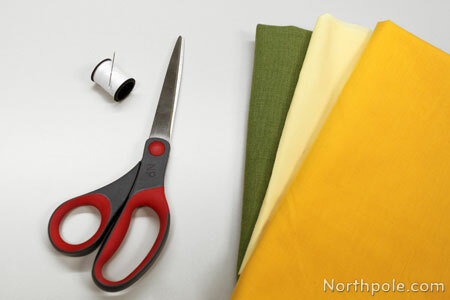 Continue sewing on the same thread, pick up another circle and fold in half. Sew a couple stitches near the corner of the fold. 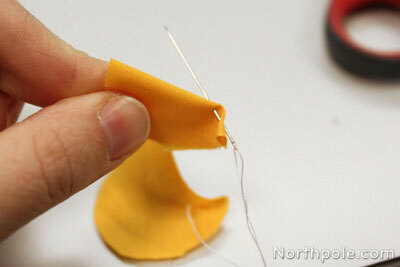 Poke needle through one layer of the fabric to bring the needle to the front. Repeat steps 4–5 for each additional petal. 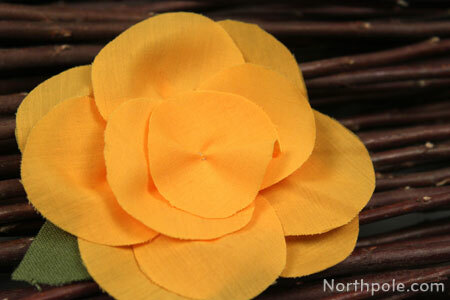 Note: Start with larger petals first, then add smaller petals as you approach the center. For the last petal, we chose a small circle, folded in half and stitched in the center of the fold (instead of near the corner). Your flower might be a little wonky, but gently arrange the petals until you are pleased. 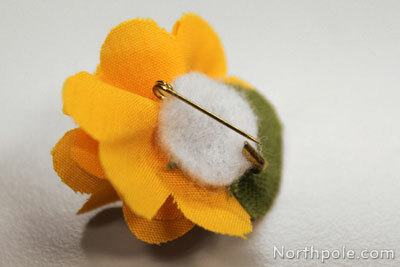 Then sew a few stitches in the center of flower—through all layers of petals. 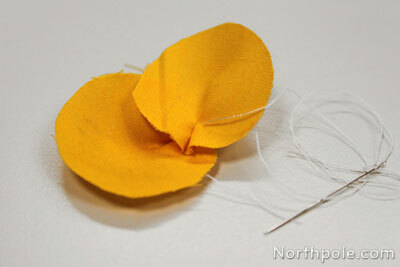 If you still have a few unruly petals, sew a few stitches to hold them in place. 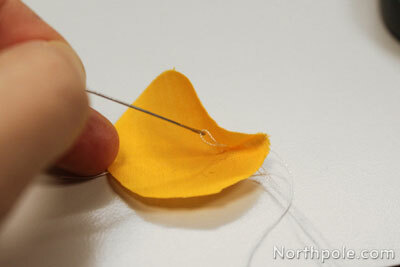 Pull thread through to the back of flower and tie the ends of the thread.�Trim the thread ends. 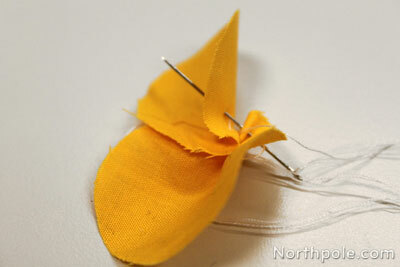 Cut a leaf or two from green fabric and sew to the back of the flower. Now your flower is finished. 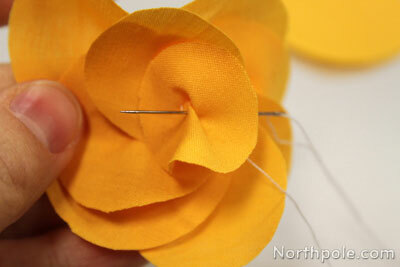 Use a sewing machine to sew the corners of each petal. 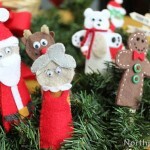 This will speed up the process of flower making, especially if you are making several of these! Decorate the center of the flower with beads or mini pompoms. 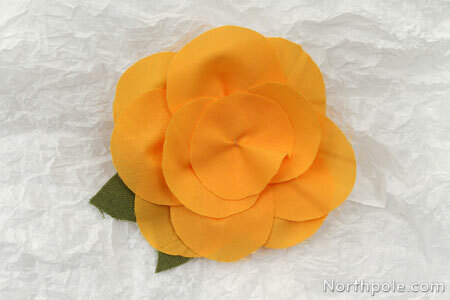 To create a flower with full, ruffled petals, fold each circle into quarters, and cut an arc to round off the corners. 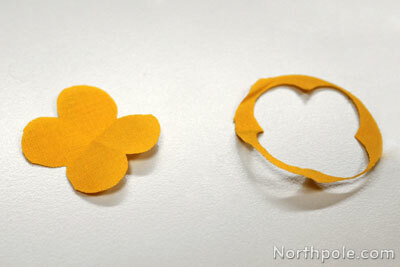 Then fold each "clover-esque" piece in quarters and stitch the points together. Lay flower on flat surface, backside facing up. 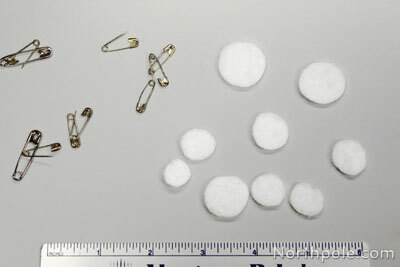 Cut a small circle from felt about 0.75–1" wide, depending on the size of the safety pin. 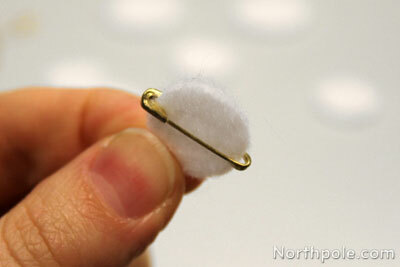 The felt circle should fit snugly in the safety pin. Hold the open side of pin between thumb and forefinger. 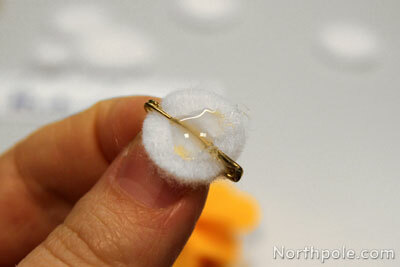 On the other side, apply hot glue to the felt and pin. Immediately apply to the back of flower. Press in place and let cool. Now you can wear your flower with your favorite outfit!